Night of April 6, 1862. "During the night rain fell in torrents and our troops were exposed without shelter. I made my headquarters under a tree a few hundred yards from the river bank." 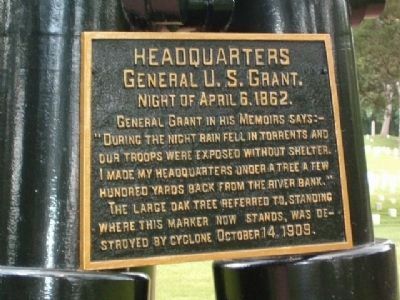 The large oak tree referred to, standing where this marker now stands, was destroyed by cyclone October 14, 1909. Location. 35° 9.031′ N, 88° 19.256′ W. Marker is in Shiloh, Tennessee, in Hardin County. 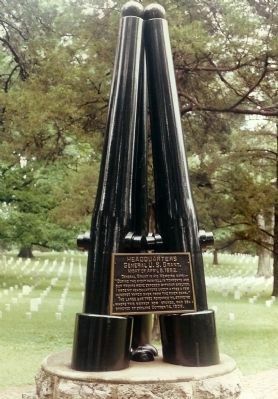 Marker is on National Cemetery Road, on the left when traveling east. Touch for map. 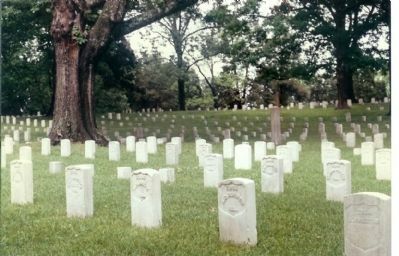 In the National Cemetery, Shiloh Battlefield National Park. Marker is in this post office area: Shiloh TN 38376, United States of America. Touch for directions. 55th Illinois Infantry (about 300 feet away, measured in a direct line); Army of the Ohio (about 400 feet away); Army of the Mississippi (about 400 feet away). Touch for a list and map of all markers in Shiloh. More. Search the internet for Headquarters General U. S. Grant. Credits. This page was last revised on June 16, 2016. This page originally submitted on April 8, 2008, by Mike Stroud of Bluffton, South Carolina. This page has been viewed 1,072 times since then and 7 times this year. Last updated on March 23, 2015, by J. Makali Bruton of Querétaro, Mexico. Photos: 1. submitted on October 22, 2008, by Nick Kurtz of Littleton, Colorado. 2, 3. submitted on April 8, 2008, by Mike Stroud of Bluffton, South Carolina. • Bill Pfingsten was the editor who published this page.